I would have to say wallball, I feel this is an awesome overall movement. TTB, I just struggle with these, I think it is a flexbility issue, I’m not very flexible in the hips. In high school I was on the tennis team, basketball team and the track team (my least favorite at the time), I was also on the cross country ski team for one year. In college I was on the tennis team and basketball team. I have played on womens recreational volleyball team and softball team throughout a lot of my adult years. I have since run a couple marathons, triathlons including the Mussleman, and have ridden the Highlander several times. 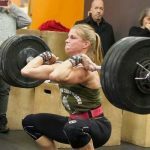 I was transitioned slowly into CrossFit by following Linda Bombard around, so I really don’t remember my first say WOD, but I knew I was hooked from day one. What sort of changes have you seen in your body, health and fitness since starting CrossFit? Well first and foremost strength–I feel far stronger than from just running or riding. This has especially helped with keeping my energy levels up and my stress levels down, I don’t think I could run a business like mine without the help of this and working out in general. 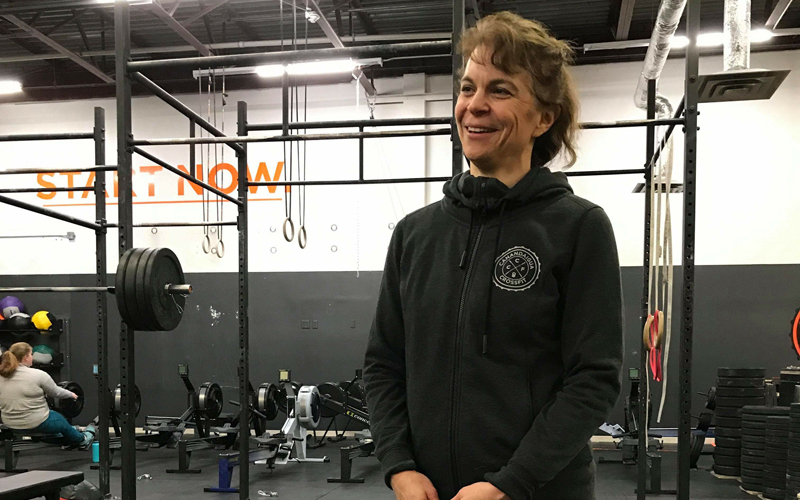 I remember that first year Linda opened this place and doing Murph in May with everyone – the excitement and energy of everyone was crazy – it was when I first realized what the “community” thing was all about. Do you have any advice for people who are just starting out? I know a lot of people feel intimidated by some peoples strength – hell I am too, but don’t be – we all learn from each other and feed off of each others strength. 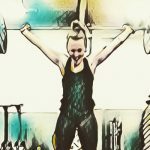 Outside of CrossFit what other hobbies or talents do you have? Because I work a lot there is not a lot of time for much more, so most of it is spending time with my kids, Lindsay and Ben. I do plant a large garden in the spring and believe it or not I like to experiment with cooking at home, ya know, healthy cooking :).